I better start at the beginning, as this journey to my “awakening”, and one that hugely affected my business philosophy was not easy. And it’s likely to become a mini-series that might offend some. Organic cosmetic makers really aren’t going to like this. 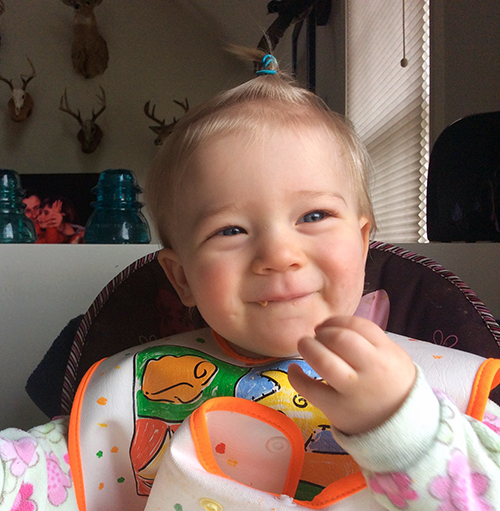 The picture below is baby Katie, (7th grandchild) munching on cheerio’s. She’s the reason I began to research the organic industry. She’s now 3, a sweet, happy little girl. I’ve been babysitting her at times when my daughter and her husband who are pilots, fly on the same days. Their regular nanny is a school teacher- so I fill in during those times during the school year. Who else will travel at 5 am on a snowy morning for 45 minutes, to put 2 older girls on the bus, wave bye to two older boys and care for a little one, but a mom, right? Sometimes those days stretched into consecutive nights because pilots generally go on trips for 3-5 days before they return home. Baby Katie with a cheerio slipping out of her mouth. When the frozen breast milk ran out, I had to go to the store and buy organic milk. I was taken aback at the price of 1/2 gallon of milk $4.95. I wanted to find out exactly what was different about this milk that would justify the price. I’m a skeptic at heart and love to read product claims. I asked my daughter why she was using only organic milk and she said she thought it was pesticide-free. It turns out that’s why nearly all consumers of organic products do so. The biggest lie ever sold to the American people is that organic products don’t use herbicides, or pesticides, and the organic industry is happy to perpetuate the misconception. Do they think bugs and weeds magically fly past “organic” crops? Ha! All crops are subject to disease and infestation. The difference is the SOURCE of the pesticide. Organic pesticides are (with some exceptions) are derived from natural sources. (here comes the naturalistic fallacy again). A pesticide whether a natural chemical or not, has the same mission: to kill insects or weeds. The source of the pesticide tells you nothing about toxicity. Some of the organic natural pesticides can be worse for the environment. More on that later. There is no nutritionally significant difference between organic and conventional crops. Both have pesticide residues well below the threshold for potential harm. The amounts of synthetic pesticides on foods are far below anything that could even be considered biologically relevant. There are no outstanding benefits with organic- except the price is higher for those that have money to burn. It’s all in the marketing. Take that one step further to topically applied organic products. Your skin doesn’t care at all about your philosophy, or where the individual ingredients in your face oil came from. Does it perform any differently? Someone tell me how! The sellers of these products try to link it to health on the basis of purity and the underlying presumption that organic means gown without pesticides. So it’s supposed to be safer. And that’s a lie. But if it’s keeping you up at night, here’s an idea: just rinse your produce with dihydrogen monoxide before you eat it! Is it possible your skin absorbs everything? You’ve heard it, or read it; it’s all over the internet. Makes me crazy (er). “Skin absorbs everything you put on it”. “Everything you put on your skin goes to your bloodstream in 29 seconds”. “Your skin absorbs 60% of what you put on it”. The above shows the lack of understanding of skin physiology or too much time on junk science sites perpetuating false fears. Please try this at home: Sit in 8 gallons of water in a bath tub and see if you come out weighing 64 additional pounds from absorbing all that water. With so many variables and thousands of cosmetic ingredients, the extent of skin absorption lies between 0 and 100%. To be sure there is passive absorption of materials that get into the body. No argument there. Caffeine is found in urine a day after topical application, and there’s a lot of focus lately on the intrafollicular pathway for absorption of chemicals. But don’t fret; the stratum corneum is a unique physiochemical barrier. A very efficient barrier. One tough integument. If it didn’t keep bad things out and the good things in, we’d be in trouble. Most substances applied to the skin simply sit there until it is rubbed or washed away. 1) virtually all common contact allergens are under 500 Dalton, larger molecules are not known as contact sensitizers. 2) the most commonly used pharmacological agents applied in topical dermatotherapy are all under 500 Daltons. 3) all known topical drugs used in transdermal drug-delivery systems are under 500 Daltons. 4) clinical experience with topical agents such as cyclosporine, tacrolimus and ascomycins gives further arguments for the reality of the 500 Dalton rule. Source: Experimental DermatologyVolume 9, Issue 3, Version of Record online: 24 DEC 2001. I find it amusing that the “skin absorbs everything” people point to transdermal drug delivery patches as proof for their argument. There has been tremendous research, time and money spent to develop transdermal patches that work because the stratum corneum is so efficient in keeping things out of the body. Not all therapeutic drugs are suited for transdermal patches. That is why we still have to inject drugs intramuscularly, subcutaneously or intravenously. If it were so easy to get chemicals to cross the dermal barrier, the pharmaceutical industry wouldn’t be developing adjunct methods to accomplish this- such as nano materials, lasers, microneedles, iontophoresis, electroporation and ultrasound AND we wouldn’t have the need for penetration enhancers. *That’s why I snicker at the sellers of “magnesium oil”. It’s ionic (charged molecule) and not likely to absorb through the skin- even if you sit in a tub of Epsom salts all day. There’s no good science to support it. You get magnesium from food. If your body is in need of it, your doctor will put you on supplements. The one study that tried to show transdermal absorption was done by (drum roll) the Epsom Salts people lol. Small study 19 subjects. Duration of bath 12 minutes. Measurements via blood and urine. Without radioactive labeling of what is being measured, how can they prove the increase in Mg or SO4 is from a 12 minute bath? The levels of these ionic species are always changing in the blood and urine. They’re dynamic-and affected by the metabolic processes in the body. BTW, if magnesium oil did work, it would be a drug- not a cosmetic. There may be people that swear by it, but hey, placebos work pretty well. 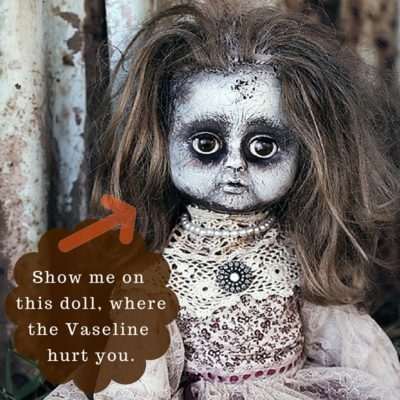 Part 1 Talked about Vaseline or any derivative of a petroleum product increasingly demonized by the “if it didn’t come from a plant, it’s no good” crowd. Oh, wait, maybe it did come from a plant (eons ago). It still isn’t welcomed into the natural club. 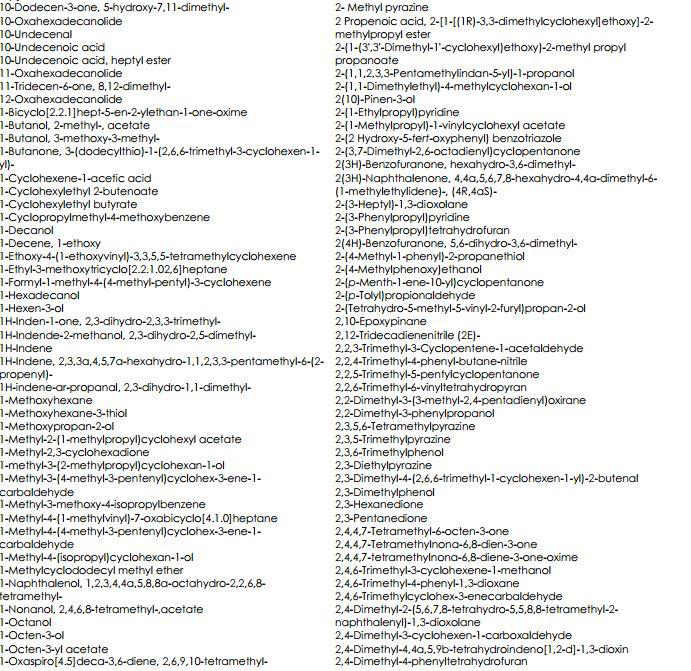 Seems there is no rhyme or reason to some of these beliefs- where some chemicals are considered “natural” by even though they are synthesized. Soap is an example. It’s starting materials are something such as olive oil, palm oil, coconut oil. It goes into the kitchen natural, but what comes out is not found anywhere in nature. Soap is synthesis. Funny thing is, the sales are pretty impressive for Vaseline Total Moisture, which had sales of $78.1 million dollars in 2014. Must be working pretty good. Must be satisfying lots of people. The thing is, with the “naturalists” they sometimes forget that the majority of people focus on performance and the way it makes their skin feel, as opposed to where it came from or some ideology. Taking a deeper look into why some would think mineral oil or petrolatum is harmful. Mineral oil comes from naturally occurring crude petroleum oil. There was a period of time when the oil was only mildly refined and contained poly aromatic hydrocarbons which are carcinogenic. White oils meeting the BP/USP specification have been treated to remove the aromatic components which are, deemed responsible for the carcinogenic potential of mineral oils. Since the 1960’s the refinement of crude oil undergoes a severe hydro-treatment procedure and the PAH molecules have been removed. What you are left with is a super clean mineral oil testing negative with the Ames test for carcinogenicity. No reactive species. no odor, perfectly colorless and absolutely consistent products. Non-acnegenic . So early on, there was a health problem with products lightly refined from crude oil, but not anymore. As an aside, rancid veggie oils also show up as carcinogenic- most likely due to radical peroxyacids and epoxides. I’m so weary of the attacks on cosmetic ingredients by people trying to get a leg up on their competition. This is about petroleum products; petrolatum & mineral oil. When all or parts of the EWG’s dirty dozen are cut and pasted onto websites, “petroleum-free” is among them. I often wonder what the big deal is about mineral oil or petrolatum? Does anyone personally know someone who was injured? Where are the reports? Has it damaged anyone’s skin? So why the hate? I wish I knew. Why did petroleum derived ingredients fall to the bottom of the barrel of public opinion? Is it about the non-renewable aspect? Or is it herd mentality; the ones that follow site like the EWG? 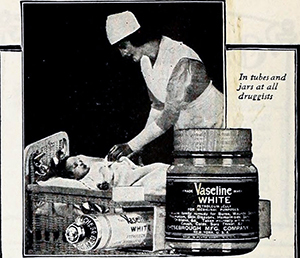 1895 Robert Chesebrough discovered petroleum jelly. He noticed that the residue from the oil drills appeared to help heal cuts and burns. Petrolatum was used to cover open and poorly healing wounds. Until antibiotics were available, the only possible method for curing gangrene was maggot therapy, in lieu of amputation. Maggots were put on wounds to chomp on the necrotic tissue- along with the microbes causing gangrene. Petroleum jelly has the ability to block water, and create a barrier to the environment which can be full of germs and dirt. It kept the wound from drying out and expedited healing. Mineral oil is not occlusive. At best it is semi-occlusive. It doesn’t smother the skin. Skin doesn’t breathe. Your lungs do. There is no nutritional benefit. However, the skin doesn’t absorb any nutrients from the topical application from vegetable oil either. It’s used in several industries including food preparation and serves as the base ingredient in many topical pharmaceutical ointments containing active ingredients. From a dermatological perspective, mineral oil and petrolatum are used as vehicles for patch testing other materials for allergy and irritation because they are so non-reactive on the skin. It’s an FDA monographed skin protectant when used at a specified percentage. I prefer Abyssinian oil or Caprylic/Capric Triglycerides but that does not mean that mineral oil is the evil incarnate. What does your face and Gonorrhea have in common? Gonorrhea may soon become untreatable. The Centers for Disease Control and Prevention recently reported that the Neisseria gonorrhea bacteria may be developing resistance to the only two antibiotics left that can cure the sexually transmitted disease. The drugs, azithromycin and ceftriaxone, are used in combination to treat gonorrhea, a strategy experts hope will prolong the period during which these critical drugs will work. Source:https://www.statnews.com/2016/07/14/gonorrhea-antibiotic-resistant-untreatable/. No one wants gonorrhea…and if diagnosed would likely hurry to get their prescription filled. That’s why it puzzles me that some maker/marketers will go to great lengths to hide, apologize or brag about the lack of PRESERVATIVES in their formulas. 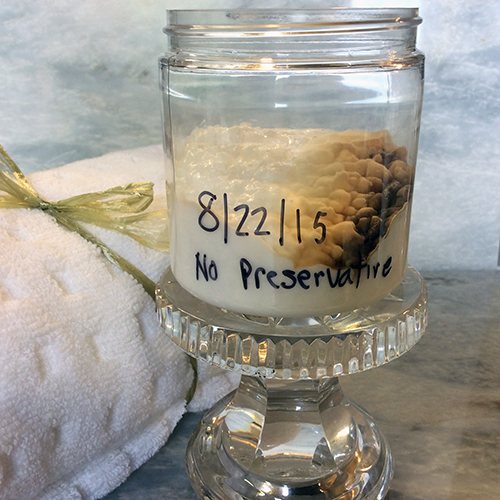 Because that’s what preservatives do; keep the bugs/microbes at bay. Bacteria, fungi, and yeast might be natural, but I don’t want to rub them on my skin. I’ve seen the term “nasty synthetic preservatives”- many times on social media and it has me shaking my head. It makes me shudder to think of slathering unpreserved products around my eyes because the eye area has more stringent limits when it comes to microbial count. I don’t get bragging about not using preservatives- as if that’s a selling point or advantage. You wouldn’t swim in a pool without chlorine would you? It’s like a taxi company shouting “ride with us, we have no seat belts”, or try our unrefrigerated ham-squirming with maggots. 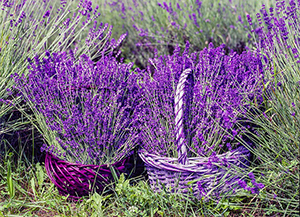 Many makers are looking for a gentle natural preservative. I don’t think they exist. It’s like asking for a kinder gentler cancer. Trying to get around this means tweaking new preservative combinations or eliminating bug food in the formula and it adds up in terms of time and the costs of testing. Start by educating the consumer about the need for preservatives in water based products. I don’t apologize for using an effective preservative in my products. One may know what the customer wants, but it’s best to give them what they need. Safety comes before ideology. Bacteria via a sexually transmitted disease or from underpreserved eye cream can be bad for your health. 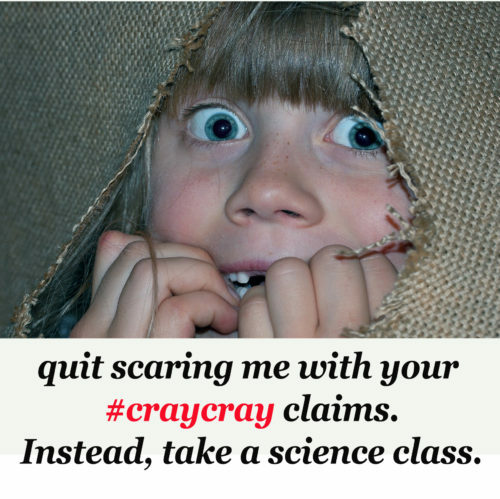 Continuing on with a discussion of soap claims, fear-based selling by demonizing anything synthetic- “If a message results in a visceral feeling of fear or anxiety, if the messenger proposes a solution that promises or claims to alleviate that fear and anxiety and if the solution is to support the messenger or purchase something from the messenger, think about it…long and hard”. In part 1: http://www.lepamperedpig.com/blog/is-it-possible-that-soap-can-lower-your-iq-part-1/ the soaper is producing some gorgeous soap and he’d do just fine by highlighting the merits of his soap instead of causing anxiety and fear. The next ingredients he complains about are Sodium Tallowate and or Sodium Palmate because he does not want to spread palm oil or beef fat all over his body. He accuses commercial enterprises of hiding the fact that they used lye and it is not disclosed on the ingredient sheet. Many commercial producers of combo bars use pre-saponified soap pellets (free of lye), which are blended together with other ingredients such as color, exfoliants, scents, etc. natural. The FDA is very strict on what can be used in cosmetics to make sure there are no harmful impurities such as heavy metals. Colorants for soap may a different story, but since he makes claims about his soap, it puts it into the cosmetic category, if not a drug category. Another set of chemicals that he warns us about are fragrance aroma chemicals- Because of the scary hard-to-pronounce words. He only uses essential oils and claims this tones and firms the skin! This tells us nothing really. It’s designed to frighten people. It’s aimed at those people who do not have a basic understanding of chemical nomenclature and who associate complicated names with toxic. 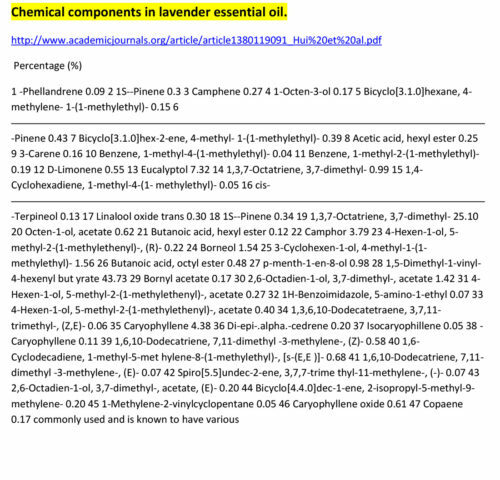 If you take a look at just one (natural) oil- lavender you can see a similar set of scary names.